You’ve probably heard about the incredible results that influencer marketing on social media can drive. In case you’re new to influencer marketing, influencer marketing is the use of trusted and influential individuals to promote your brand, in our case, on social media. Back in the days, the influencers were worldwide celebrities who people looked up to, but with social media, it has opened up the opportunity for virtually anyone to become an influencer and build an audience. Okay, so influencer marketing is good and all, but what if you could build influencers all by yourself on social media? That’d mean that more people would listen to you directly, value and pay attention to the things you say. Including promotions of your own brand that you do, of course. Building influence as a brand is difficult. I’m not going to lie. If it would be easy, all brands would have people listen to them the way people listen to advise by influencers. People know that brands have one goal and one goal only: to make more money. Therefore, they’re a bit skeptical (read: insanely skeptical) to listen to what the brand is saying because they know it will all be angled in a way that benefits the brand. But what if I said that it is possible? What if I said that you can establish your brand as more influential? While you’ll have a hard time getting to the influence level of real social media influencers, you’ll come a long way, and you’ll be far better off than you were before. In this article, I’ll teach you how you can build your brand’s influence using social media to get more people to actually listen to what you are saying. If you’re focusing on several things at once, you probably aren’t going to become an expert on any of them. Instead, you’ll become average that doesn’t stand out in any way. However, if you instead focus on one thing, one sport, one industry, you’ll quickly be able to build up the 10,000 hours it is said that you need to fully master something. And when you become an expert, people will start seeing you as an industry expert, a leader in your industry and a go-to source that they can go to for advice. When I say Michael Phelps, what sport do you think about? People remember the industry-leaders who show that they are the absolute best and most knowledgeable, and as a result, they eventually also start trusting them for advice. Your ultimate goal is to show that you have so much expertise in your industry that people automatically start associating your brand with your industry. And once you’ve done that, you know you’ve come a long way. This is a golden rule that you should have in all aspects of business and nonetheless for building your brand influence on social media. First off, if you want to succeed on social media, and want to attract people to your brand on social, you need to provide valuable content. Because every day, today 3.2 billion images are shared each day. And that’s just images. Well, the competition for people’s attention is incredibly though. 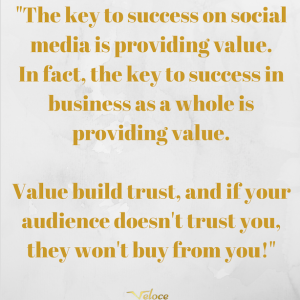 That’s the practical reason to why it’s important that you need to share valuable content on social media because if you don’t, you won’t have people that you can build your influence over. But regarding content and building influence as a brand, there’s a great reason you should focus on putting out quality content. A misconception about providing value with the content you share is that it has to bring some sort of value in the monetary form, however, that’s obviously not the case. Different audiences consider different things to be valuable, so, therefore, it’s also important that you know your audience and what they find valuable. For example, a tutorial on how you catch the biggest fish might be incredibly popular among an audience of fishermen, however, for an audience that is into beauty and makeup, it probably is completely irrelevant to them. With the content you share, you can address your audience’s pain points, and you can do so while also sharing your expertise. On social media, you can share everything from infographics, ebooks, blog posts, videos, collages, and much more. Whichever you choose though, make sure it is targeted to your target audience and brings them value. Before you begin posting content like crazy to please your audience and provide them with value, you want to define your ideal audience first and try to understand what pain points they have, and what you can give to them that they’ll find valuable, in terms of content. 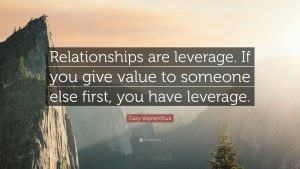 The master of providing value is entrepreneur Gary Vaynerchuk who has truly embraced the value part of a customer interaction. That’s because he has realized just how effective it is. When you provide value in different ways, to people time and time over, something extravagant happens with your prospect. Vaynerchuk means that the mistake most businesses do today in terms of driving sales is that they go to people and say ”buy this”. Now, I realize that our goal here right now isn’t to sell more but instead build our influence which, in turn, sell more, however, the same principle goes for building your influence. Instead of asking for them to buy from you, you start in the other end by providing them value. What will end up happening is that people will start seeing your brand as a whole as more valuable simply because of the fact that they see you as a source for getting value from. Slowly but surely, they’ll start seeing you as an authority which they can go to for advice, tips, and tricks related to the industry you are operated in. Last but not least, when they start seeing you as a brand which is an authority in its industry, you’ll be able to influence your audience simply by the things you say, and have great success doing so because you will have established trust and presented yourself as a leader that people trust. Being an influencer as a brand, and a thought leader, you should see it as your duty to discuss and reflect upon industry news and events. If you want to become the go-to source for information in your industry, you obviously need to share information about the most recent topics and not just things in general. Because once you’ve established yourself as an influencer in your industry, people will go to you to get the latest information, because they expect you to always be updated with what is happening based on the expertise you have shown to have. To build and strengthen influence, you need to be at the forefront of everything that is happening in your industry, and if you aren’t, people might see you as an imposter or someone that isn’t worth trusting. Always stay updated with the latest news in your industry, and do everything you can to get access to the latest news. By doing so, you’ll naturally become an industry-leader, thus getting more influence over your audience. The principles are simple, really. The key is just understanding how people get access to information about the industry they’re passionate about – and how they look at the person or brand that can deliver that. Instead, you’ll fade out in the noise. Add your own personal touch to everything you share and don’t forget to add relevance. Obviously, when developing your brand message, you need to pay great attention to your target audience. If the people in your industry which you are trying to get an influence over are teenagers and speak slang, you won’t resonate very well with them if your brand has a personality that’s very traditional, conservative and boring, right? People who have their own style tend to be remembered while those who don’t are forgotten and fades out just as quickly as the gained fame. Michael Jackson is a perfect example of someone who had a completely unique style. And think about the influence he had on people when he was alive. Building relationships with business professionals in your industry. If you want to build your social media influence, you need to connect and build relationships with industry professionals who are in the same industry as you and have established themselves in it. Building relationships on social media is crucial for success, and even if professionals in your industry can be straight up competitors of yours, you’ll be far better having them on your side and working together, rather than working against each other. As you build your relationships with them and engage with them on a regular basis, showing support to them, you can be sure that they’ll repay you and show their gratitude in one way or another – a way that can benefit your job of building your brand’s influence in the long run. And remember: quality is far more valuable than quantity, so focus on establishing strong relationships rather than weak and many. Once you’ve established a relationship with professionals and authorities in your niche, you can ask them if they would have any interest in partnering with you. Because these people have already established themselves as influencers in your industry, partnering with them can be tremendously effective, as some of the trust they have will be contagious and given to you. There are literally thousands of ways you can create a partnership with authorities in your industry. Do you want to arrange a giveaway? Do you want to live stream together with them? The key is to have a partnership that is valuable to both parts while getting exposure from the partner’s audience. And best of all, having the person explicitly tell people how good your brand is. The key to social media success is, according to me engaging with your audience and building a relationship with them. I’ve said it many times before, but I am ready to say it a million times more because I really do think that relationships are the fuel to the social media success fire. Who is it that determines your success on social media? Who is it that determines your influence and the level of trust they have in you? First off, we can just put the myth that the more followers the better, to sleep. Because the truth is that unless they are actually engaged in your brand and the things they are sharing, they’ll mean nothing to buy, because they still won’t listen to what you have to say, and they will definitely not be influenced by you. What’s more, buying fake followers won’t help you in any way, because they will never be influenced by you, never support you, never interact with you and never buy from you. Okay, I did tell you that you need to provide value to your audience, and I explained that there were several reasons for this. But the key to building influence, especially as a brand, is showing your expertise. There’s no going around it. When people start realizing how knowledgeable you are, they’ll start listening to you. And when they do, they’ll soon realize that you actually have relevant and interesting things to say! This, of course, demands that you actually have expertise within the industry you’re in. But if you don’t, I would strongly question if you really should be operating in it. The only way to make people aware of the knowledge and expertise you hold is to share your knowledge with them. For this, only your imagination sets the limits. You can arrange Q&A sessions where your audience can ask you anything related to your industry, you can run a live video that allows you to come closer to your audience and them to build trust in you, by answering to them directly with your expertise. You can also create videos where you talk about your industry and what is going in it. In general, brands are very little trusted. People know brands have one goal, and that is to sell more. Everything they say will just be to promote their own brands, which means very angled answers to their benefit. But did you know that you actually can increase your influence over people on social media? With a strategic and consistent plan, you can get more people to you have to say and get them to see you as an industry leader and go to you for advice and knowledge related to your industry.